Warwick Davis with James and Oliver Phelps attend the reveal of the original Harry Potter film's Gringotts Wizarding Bank at Warner Bros Studio Tour London Ð open to the public on 6th April. *** FREE FOR EDITORIAL USE *** Warwick Davis with James and Oliver Phelps attend the reveal of the original Harry Potter film's Gringotts Wizarding Bank at Warner Bros Studio Tour London Ð open to the public on 6th April. *** FREE FOR EDITORIAL USE *** Warwick Davis with James and Oliver Phelps attend the reveal of the original Harry Potter film's Gringotts Wizarding Bank at Warner Bros Studio Tour London – open to the public on 6th April. Warwick Davis and James and Oliver Phelps who played Griphook, Filius Flitwick and Fred and George Weasley respectively in the Harry Potter film series were joined by goblins for a sneak peek of the authentic Gringotts Wizarding Bank set at Warner Bros. Studio Tour London. From the brass leaf details on the columns to polishing the Sword of Gryffindor, finishing touches are currently taking place to ensure that the wizard’s bank is ready for the official opening on April 6. Entering this impressive set, visitors are invited to step into the grand banking hall, underneath the magnificent ‘crystal’ chandeliers to discover the secrets behind goblin prosthetics, costumes and so much more. From concept art and prop making to set design and prosthetics, visitors will unlock the filmmaking magic behind the famous wizard’s bank. Lined by towering marble pillars, the grand banking hall will be decorated with three magnificent crystal chandeliers and finished with real brass leaf. Inkwells, quills, ledgers and piles of Galleons, Sickles and Knuts will complete the goblin tellers’ desks as seen on screen. The prop-making department, led by Pierre Bohanna, created over 210,000 coins for the final two films alone. Each prosthetic mask took weeks to create, with every hair individually inserted and veins painstakingly painted by hand. 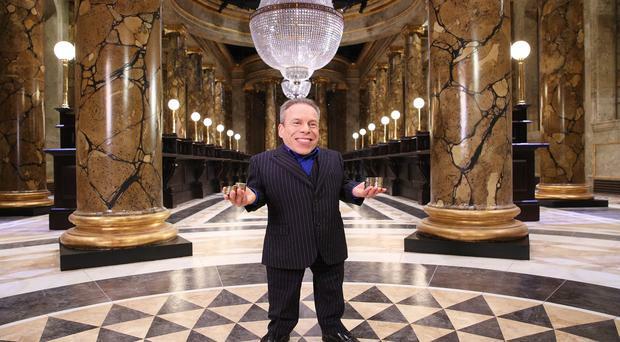 It took four hours to transform actor Warwick Davis into Griphook in the films which included him wearing black contact lenses and dentures with extremely sharp teeth to complete the goblin look. During filming 38,000 pieces of rubberised treasure were created for the Lestrange vault including 7,014 Hufflepuff Cups. Here, visitors can try out a unique photo opportunity allowing them to step inside the Lestrange vault and surround themselves with treasure. Officially opening on Saturday, April 6, the 16,500sqft Gringotts Wizarding Bank expansion will be the Studio Tour’s biggest addition to date and has been designed and built by many of the original crew members who worked on the hugely successful magical film series.